You might have heard stories where a serious medical condition in a family has drained them of their wealth. These are not just stories but can happen to anyone. To guard against such issues – you must buy Health Insurance. The good part is you also get tax benefit on premium paid for Health insurance. 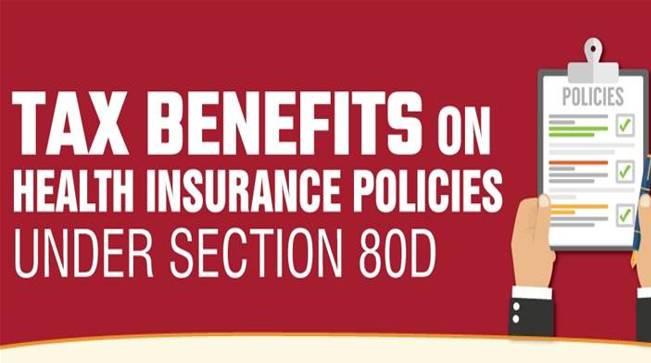 In this post we resolve what’s and How’s of Tax Deduction on Health Insurance sec 80D! How much Tax Benefit I get on Health Insurance? Budget 2018 has enhanced the limit of Health Insurance premium eligible for tax deduction under section 80D for Senior citizens. The limit is Rs 25,000 for people with age less than 60 years and it’s Rs 50,000 for senior citizens. You can also claim Rs 5,000 for Preventive Health checkups. This is within the Rs 25,000/50,000 limit. You can also claim additional tax benefit on Health insurance premiums paid for your parent. What’s the Tax Benefit for Health Insurance of Parents? You can claim additional tax deduction on the premium paid for Health Insurance of your parents. This can be up to Rs 25,000 in case your parents are below 60 years of age and Rs 50,000 in case any one of your parents is above 60 years of age. But just paying premium is not enough. The policy should have been bought by you i.e. you should be the proposer of the policy. There are cases when people pay premium for an existing policy which was bought few years back by their parents and claim tax deduction u/s 80D. This can land you in trouble. So the best way is to either buy a new policy or write to the concerned insurance company to change the proposer at the time of renewal. Can premium be split between Husband and Wife for tax benefit? Suppose you bought family floater Health insurance which has premium of Rs 35,000 which covers self, spouse and children. Now can you split this premium between husband and wife so that both can claim benefit? The answer is NO. The reason being there can only be one proposer for a policy and hence the tax benefit can only be claimed by one. To get around this you may opt for two separate policies but keep in mind the overall premium might be higher. So do your calculations before deciding. Also Read: What is the Maximum Income Tax You can Save for FY 2018-19? What’s the tax Benefit on preventive health checkup? Tax exemption up to Rs 5,000 is allowed for preventive health checkup of Self, Spouse, dependent Children and Parents. This limit is within the Rs 25,000/Rs 50,000 deduction. 1. The maximum tax deduction u/s 80D can be Rs 1,00,000 in case you buy Health insurance for self and your parents and both you and your parents are senior citizens. 3. To avail deduction the premium should be paid in any mode other than cash. However the payment for Preventive Health checkup can be done in cash. Hi Amit. This is Nilesh Health insurance family floater is purchased . Policy is in my name. All family members I e. myself,wife and two children are beneficiary. If the premium is entirely paid by my wife by cheque , my wife can claim deduction under 80d ? It does not matter who pays but what matters is who is the proposer of the insurance (means Purchases the policy and pays the premium). Sir, whether tax deduction is allowed on basic premium or basic premium plus GST u/s 80D? Whether income tax deduction u/s 80D is admissible only on Basic Premium or on Basic Premium and GST? Can I claim deduction u/s 80D for the premium paid by me for the critical illness policy of my wife? In this policy, my wife is both Proposer and Insured. She has earning below taxable limit. 1) Husband (Ram) pays 7000 for health checkup of self and his parents. He can claim exemption of 5000 in his income tax return under section 80D for preventive health checkup. 2) Ram’s Wife (Sarla) pays 4000 for health checkup for herself and her old parents (Ram’s in laws). She can claim exemption of 4000 in her income tax return under section 80D for preventive health checkup. Is this allowed or does the IT rule restrict the combined benefit for husband and wife to 5000? Thanks for sharing the information, always helpful. Could you please guide that when an insurance company rejects someone’s application then does that company share this data to IRDA? That is, is there a common pool where all rejected applicant’s data is shared for others to verify? I don’t know if the insurance companies share such information among themselves. There may be cases where one company approves the claim while other approves it according to their policies. Thanks a lot for such detailed information. One query is there. Suppose policy is brought by mt parents. Now in the next renewal I change the proposer name to myself. Then in case, my parents pay the premium from their account. Will my parents be able to claim tax benefit(as the proposer name changed to my name)? I have a two younger sister and both are married , My one sister husband is suffering with cancer of stage-II . He had a job with private sector and Yearly income is 2.5 lac . While my sister is house wife .They are not having that much financial condition . So during two times surgery we had supported her for financial . I just want to know that how i will claim this amount . further I want to know that , How I will shown that My one sister is Dependant on my income. Pl help me for the solution. As per my understanding you may not be able to show your married sister/brother-in-law as your dependent and hence cannot claim any tax benefit on this amount. Question is how & where to include the item#3 for the premium of Rs 11,000/-? a) Utilize the complete Rs 11,000/- against limits available for senior citizen parents’ head? b) Split the Rs 11,000/- into per head cost of around Rs 2,200/- (5 pax) and then add the same to respective heads of Rs 25,000/- and Rs 30,000/- limits? My research tells me that our tax guidelines are silent on this sort of situations, and leaves the door open for interpretations by the tax-payer and the tax-officer. You are right. You can do either of option a or b – should not be a issue!